I'm now at the Norfolk Naval base looking at ships. Actually I'm finished with the bus tour of the base and while on my way to the center to take the ship tour I finally spotted a public library. Yesterday, friday, I visited the Guilford Courthouse Battlefield where Nathaneal Greene's army mauled the Brits but actually retreated before it was over to assure that his army would stay intact. Before that I visited the King's Mountain Battlefield, in South Carolina where a small band of militia from "over the mountains" (western Virginia and Tenn.), defeated a small army of dreaded "loyalists"( we hate them). It was a really nice warm day, probably the nicest of the trip. Thursday I had a similiar good day visiting the "Ninty Six" battlefield and the Cowpens Battlefield, both really interesting. You would be proud of good old Gen Greene. The car has fixed itself. I think it was that it was out of oil. Oh well. I saw Cynthia on Saturday and went to dinner with the family on Easter Sunday. I had fun shooting some video on both days. 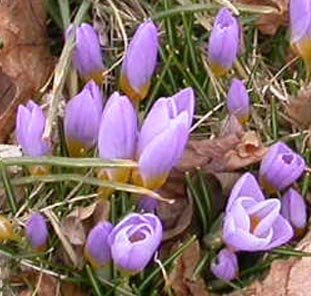 In Rhode Island crocuses and daffodils are pushing up through the soil. Bees and birds are active. Squirrels too. See for yourself at http://www.youtube.com/watch?v=thDwus6pEM0. I have now been here with Dan and Marilyn for 2 days and have been having a really nice time. I got in late friday evening and saturday morning Dan took me out on a long sight seeing ride to see the interesting things in Bradenton and environs including the manapee viewing place by the power plant, (saw 7 of the critters),the house where the Bruce Maddy and the boys stay and finally Dan's country club where Dan treated me to a nice lunch. Later that afternoon it rained like cats and dogs so we hung out at home. That evening Hayeses had 2 really interesting friend come over for a spaghetti and meatballs dinner. Today I spent the morning looking for birds at the Myaka River state park and saw many limpkins and sand hill cranes. Later in the PM I drove into St Petersburg and toured their interesting and well developed downtown. Then it was back home for a yummy din-din. Here I am in good old (expensive) Key West and enjoying it very much. I was planning on spending this time in the Everglades but my old hotel was done in by a hurricane 2 years ago and it still lies derelict and in ruins. I was a little spooked by big bad old Miami and, without Eileen, it did not appeal to me, so I had the extra time and here I am. I had forgotten how beautiful the ride down here was, almost like being on a boat out at sea. I have not been to the Keys in 12 or 15 years and it has changed little except to get more developed, if that is possible. I found a nice little hotel outside the cool touristy part of town but in a cute neighborhood none the less and with the bicycle it's no problem. I will be here for 2 nights and then it's off the mainland and eventually to cousin Rita. More later. Spring in southern Rhode Island arrives earlier than it does further north. Crocuses and daffodils are coming up. The weather is becoming warmer every day; it won't be long before we'll be barbecuing outside and taking walks on the beach. Last word from Bruce was he was in the Everglades. See the Spring in Newport Movie. Bruce called that he is near Daytona and will be updating blog soon. Today it has finally become sunny and looks like the south should look. I started the day taking a long bicycle ride up and down the beach looking for birds and just enjoying the sea and the sweet air. This was tiring as you had to go against the wind and the sand was sometimes mushy. I next went to check out our local pond for neat birdies of which there were few. However I did spot a pair of mating plumage anhingas and I thought, ah ha, maybe we will have some little anhingas and no sooner had I thought of that, they consumated the union. 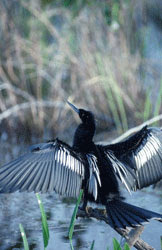 I have seen the anhingas for years building nests and raising young and fighting over territory but never actually mating. Anyway I spent the rest of the afternoon exploring the island on bicycle and sitting around gabbing with Gordon and his sister. Eileen want you to know that Hilton Head has alligators in its lagoons which are as large as 15 feet. That is pretty scary! 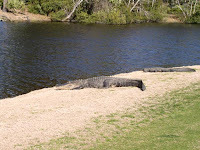 Here are the places where Bruce can see those Hilton Head alligators. Today I woke up in charming Hilton Head South Carolina at the home of my friend Gordon Bertrand. I went out early this morning and found an alligator in the local pond as well as several anhingas and heaps of huge turtles.This morning we will go out on a bicycle ride along the beach. More later. It was difficult to extract myself from the house but I did it and here I am in Newport, waiting for din-din. The boys are shaking the house down but otherwise everything is going fine. Tired of winter, Bruce will be leaving by car this weekend to find warmth and sun. He will drive all the way to Florida. En route he'll be stopping to visit relatives and friends. In lieu of email, he'll be posting entries here for us.